There is something inspiring about working with incredibly luscious fabric and gorgeous thread. The three front panels of the front lacing stays I'm creating use beige silk (a bargain purchased at the Berwick Street Cloth Shop). I just completed the boning channels for the two side front panels. Unlike sewing the boning channels in the linen panels where I was a bit crooked and messy with my backstitches, I find that working with this fabric I'm super conscious of how and where each stitch is placed. (It's like sitting up straight and using your best handwriting when the teacher is watching.) The silk thread pulls through the fabric so elegantly it makes me want to make sure each stitch is nearly perfect. I was careful to make sure I followed the recommended 6-10 Stitches Per Inch. With being so meticulous with my stitches, I was / am impressed with how nice and neat the backs of the panels look. So why am I using fashion fabric on just the three front panels and not the entire set of stays? You probably think that I don't have enough fabric, though that's not the case. I'm told that there are many museum examples in this region that only use fashion fabric on the front panels, thus showing New England frugality. In the booklet American Crewelwork: Stitches of the 17th and 18th Centuries, by Mary Taylor Landon (Winterthur Museum, 1962), states that, "...one characteristic of American [crewel] work is the lack of wool showing on the reverse side. Where one finds much long and short, satin and heavy filling stitches on English work, the Colonists used stitches sparing of the wools" (p3). This statement helps reinforce the idea of using a minimal amount of materials. 1700-1760, Made from a brocade decorated with chenille and metal thread - French silk 1760's. The back is made from brown linen and it is lined with cream linen. It is very pointed at the front with silver lace and fly braid giving the effect of a stomacher. It fastens over the shoulders with a piece of blue ribbon into two eyelet holes and fastens across the back with eyelet holes (6 on one side, 7 on the other). It is heavily stiffened. It has been let out when the backs were sewn on. 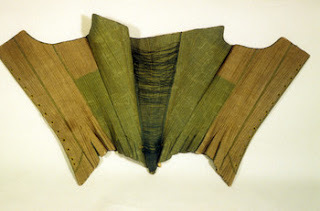 Unfortunately there's no description or details of its provenance, but it looks like it has green silk or wool on the front panels in much the same manner as I am using my fashion fabric. While these aren't perfect comps--neither pair is front lacing--it helps illustrate evidence of this technique. And the best part of being frugal with my sentimental silk: having plenty leftover for a few future projects. 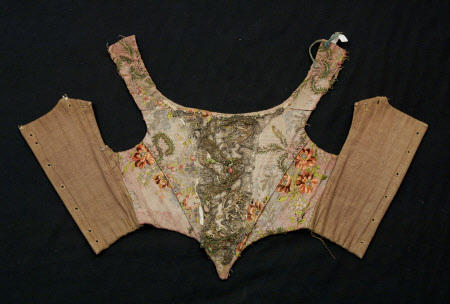 Up next with my stays: determining the direction of the stomacher's boning channels.